I have found myself speaking with several folks lately about their diets….and realizing that what we think we are eating, what we feel we are eating, what we intend to eat, is not the same as what we are actually putting into our mouths. About 12 years ago I thought I was doing a really good job of paying attention to my diet. However, when I went to see a Naturopath about fine tuning my health, she suggested I keep a food diary, to see what actually happening….oh dear. More fried corn chips and less vegetables that I realized, just to name 2 areas that I had to address. My gall bladder was very happy with me when I made some changes…. And that is the point: we can’t really know what to do next if we don’t “objectively” look at where we are. Writing down EVERYTHING that goes in our mouth, and about how much and when often leads to a better understanding of our patterns, habits, what foods might be causing problems, macro and micronutrients that may be out of balance, etc. Let me say loud and clear: DO NOT JUDGE yourself, your choices, what you notice. This is also a spiritual exercise in gentle compassionate observation. We are witnessing ourselves nourishing ourselves, and change can occur more easily if we are amused rather than horrified. We shall be talking about making small steps toward eating all real food without a lot of drama and lamenting poor choices in the past. Beyond the general notion that eating well is “good for us,” I’ll be citing interesting current research, including the rather new field of epigenetics. Food (and that includes culinary herbs) really can be our medicine. I had another request: info on the lymphatic system, and how to insure that we keep this aspect of our bodies healthy, especially detoxification during cold and flu season. The blood brings nutrition and oxygen to the cells and the lymph removes the waste, debris, and disease components such as viruses. The cells are bathed in lymphatic fluid. Fluid retention in the tissues suffocates the cells so that the nutrients can’t get in and garbage accumulates. The lymphatic system is a specialized component of the circulatory system that doesn’t have the advantage of a central pump. The flow inside the lymphatic vessels is unidirectional because of one-way valves that keep the lymph from traveling backwards but the circulation of the lymph depends largely on movement. Deep diaphragmatic breathing is possibly the best way of circulating the lymph. Breath in slowly and deeply pushing the belly out and then let the breath go slowly and completely. The dramatic pressure variance with the lung expansion and contraction moves the lymph and helps to open the ducts to allow the lymph to reenter the bloodstream at the subclavian veins at the base of the neck. Deep, slow diaphragmatic breathing for 10 minutes a day will oxygenate the blood and circulate the lymph. A Rebounder, also known as a mini-trampoline, is a great way to exercise. A simple, gentle walk in place without even lifting the feet off of the trampoline will suffice to circulate the lymph. At the top of the bounce the body experiences a moment free of gravity and at that time all of the one-way valves in the lymphatic vessels open to allow the fluid to move up. This can even be done without a rebounder just by bouncing on the toes. Also, be sure to swing your arms, as this also helps act as a pump. Specialized massage by a trained massage therapist is a great way to work with the lymphatic system; however, we can do this at home as well. Massage the skin in the direction of the heart. Any kind of movement such as walking will circulate the lymph because of the muscle contractions. Even laughter works well to get the fluid in motion. Iris Herbal has a couple of massage oils that greatly assist this process. If you go HERE you’ll find more info on these lymphatic massage oils. There are several herbs that assist the body in keeping the lymphatic system healthy. If you have been sick, a tea or tincture of either Red Root or Red Clover Blossoms will be helpful. Adding a little Calendula Flowers to your herb tea is also a good tonic. PS…every once in a while, no matter what one does, WordPress does what IT wants and not what I want in regards to layout…sigh. If You Thought Round-Up Was Bad…. Keep this GE genie in the bottleUrge USDA not to approave Dow’s 2,4-D-resistant GE corn. This one is pretty simple: Dow and USDA hope to quietly approve a new genetically engineered seed line that basically swaps RoundUp (glyphosate) out and an even worse weedkiller (2,4-D) in. Bad idea. The pesticide treadmill is catching up with Monsanto, as glyphosate-resistant “superweeds” run rampant and their blockbuster product line nears the end of its life-cycle. Dow wants to drop in an even more toxic herbicide (2,4-D) to keep the treadmill running at high speed. We have until February 27th to stop this. Tell USDA that you want off this ride» USDA opened a public comment period over the holiday break, as they tend to do for controversial decisions they want to bury. But we’re paying attention. Dow aims to get 2,4-D-resistant corn to market this year, soy next year and cotton in 2015. These three crops dominate U.S. agriculture, blanketing over 100 million acres of mono-cropped countryside, driving the pesticide market. 2,4-D is a more toxic herbicide, both to humans and to plants. It is a reproductive toxicant, suspected endocrine disruptor and probable carcinogen. Children are particularly susceptible to its effects. 2,4-D does and will drift off of target crops – both through spray drift and volatilization. This will devastate adjacent ecosystems and poses a very real threat to rural economies and farmers growing non-2,4-D-resistant crops. Conventional farmers will lose crops while organic farmers will lose both crops and certification, resulting in an economic unraveling of already-stressed rural communities. 2,4-D-resistant “superweeds” will arise and spread just as RoundUp-resistant “superweeds” have taken over farms and countryside in the Midwest and Southeast. Corn is wind-pollinated, which means that genetic material from 2,4-D corn will contaminate non-GE corn. You cannot put a GE genie back in the bottle. The risks are far too great» This dangerous and antiquated herbicide shouldn’t be on the market, and we certainly should not be giving Dow license to profit from driving up use. We’ll need to make a lot of noise on this one. Thanks so much for adding your voice! New Year’s greetings, everyone. Hope y’all had a lovely holiday(s), Holy day(s), holidaze…. 2012 marks Iris Herbal Product’s 30th anniversary. Holy guacamole, have I really been this focused, fortunate, and yes it’s been a wild ride and more to come. Stay tuned to this blog for “blog -reader-only” specials and sales. I will also be offering deals to those who receive my (sort of) monthly newsletter. You can go HERE to visit my homepage and see what’s new, what’s on sale, and to register for my newsletter. 1500 Employees Skip Holiday Party to Transform Local Farm In place of a holiday party, computer technology company NVIDIA conducted one of Silicon Valley’s largest-ever employee volunteer events, with 1,500 employees and family members building structures that transformed a local community farm, donating services and materials totaling $380,000. Conservationists in Malaysia airlifted a young Sumatran Rhinoceros — one of the world’s most endangered animals — from an area where she had no hope of ever seeing another rhinoceros. After monitoring her isolation since 2007, the Sabah Wildlife Department and Borneo Rhino Alliance flew the female rhino, named Puntung to a forest where she would encounter a potential partner. Girl Sends Wish to Santa on 2 Pink Balloons, Answered 700 Miles Away Just eight months ago, a one-acre plot at a Denver public school was an unused athletic field, but now that land has come to life with food-bearing vegetation producing 3,000 pounds of food for the cafeteria. Millions know his name now. 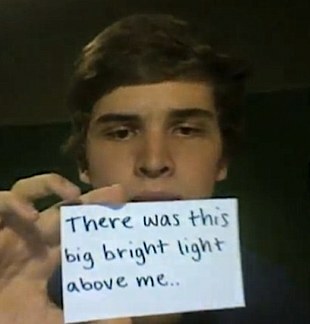 After cheating death three times, Ben Breedlove, 18, finally lost his life on Christmas day, but not before leaving a moving last message recorded for YouTube telling of his three near-death experiences and how at peace he finally felt with his fatal heart condition and the life he would likely soon leave behind. After watching the devastation of neighborhoods after Hurricane Katrina, Borders CEO Louise Riggio promised to give away new homes to 100 displaced families. At the dedication of the final home, a gospel choir sang “Ain’t No Mountain High Enough” while 55-year-old Corliss Gaines’ eyes swelled with tears. The Surprisingly Upbeat State of the World: Trends are Strikingly Positive Regular readers of the Good News Network know about these four major areas where global progress is heartening: War is on the decline, poverty is shrinking, women around the world find their lot improving and democracy is spreading. The leading indicators in these four areas cannot be denied.